I love making cupcakes because they’re so pretty, but man, they’re so much work! This is probably because I’m on a filled cupcake kick. I bought a cupcake corer and I’m obsessed with it. My recipe inspiration for these was a Caramel Frappucino cupcake recipe from Pixie Crust. Spoiler alert: I changed it a lot. I just don’t have that much time on my hands. 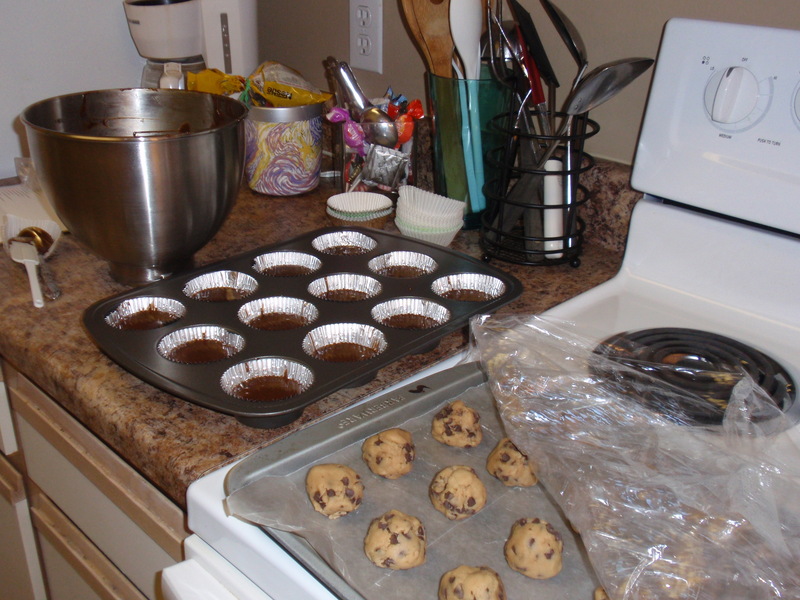 Step 1 – this is going to make all you baking purists hate me – I used a boxed cake mix, OMG. I’ll let you all recover for a minute. Here’s the thing. Go read the original recipe from Pixie Crust. There’s like 50 million steps!!!! So back to my Step 1. Chocolate cake mix – with pudding in the mix! Follow the instructions on the box (this is rocket science, I tell ya!). 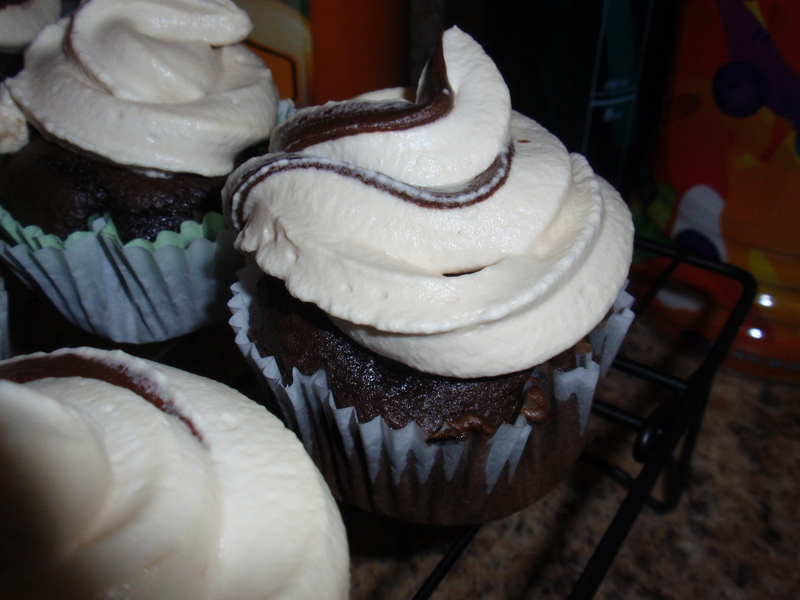 I added an instant coffee packet to the water, to make mocha flavored cupcakes. MMMM. Makes 24 cupcakes. Step 2. While the cupcakes are cooling, make the mousse. I halved it, so the measurements are kind of weird. It was an awkward recipe to halve, but you will have way too much mousse if you don’t. (I didn’t, but I’m halving it for you because I love you). Whisk sugar, yolks, water and espresso powder in large metal bowl. Set bowl over saucepan of simmering water (do not allow bowl to touch water); whisk until candy thermometer registers 160°F, about 3 minutes. Remove bowl from over water. Using electric mixer, beat egg mixture until cool and thick, about 5 minutes. Beat cream, liqueur and vanilla in another large bowl until stiff peaks form – this might take a while. Fold cream mixture into egg mixture. Step 3. Core the cupcakes! Once cupcakes are cool, core out the center of each one. If you don’t have a corer, you can use a knife to hollow the cupcake out. Heat sugar, egg whites, and salt in a heatproof mixer bowl set over a pan of simmering water, whisking until sugar dissolves and mixture registers 160 degrees on a candy thermometer. Return bowl to mixer, and whisk, gradually increasing speed from low to medium-high, until stiff, glossy peaks form, about 10 minutes. Reduce speed to medium. Add butter, a few pieces at a time, whisking well after each addition. Whisk in vanilla. Switch to a paddle attachment and beat until air bubbles are gone, 2 to 3 minutes more. Curious how I got that stripe of chocolate in my mousse frosting? I based it off this method from Our Best Bites, where you essentially paint a stripe INSIDE your pastry bag/ziplock back with gel food coloring, or in my case, melted chocolate. Before you put your frosting/mousse into the pastry bag, carefully paint vertical streaks of chocolate or food coloring all the way down to the tip. THEN add your frosting. You have to try to drop the frosting straight down into the center of the bag so you don’t smudge the lines too much. And then you get awesome stripes in your frosting! My boss told me she hated my guts yesterday. Normally, this would be a cause for concern, but she was walking down the hall carrying her second piece of cheesecake when she said it, so I knew it was actually a good thing. These cheesecake bars turned out fantastic! I modified a recipe from a Cake Mix Cookies cookbook Erin gave me for my birthday. 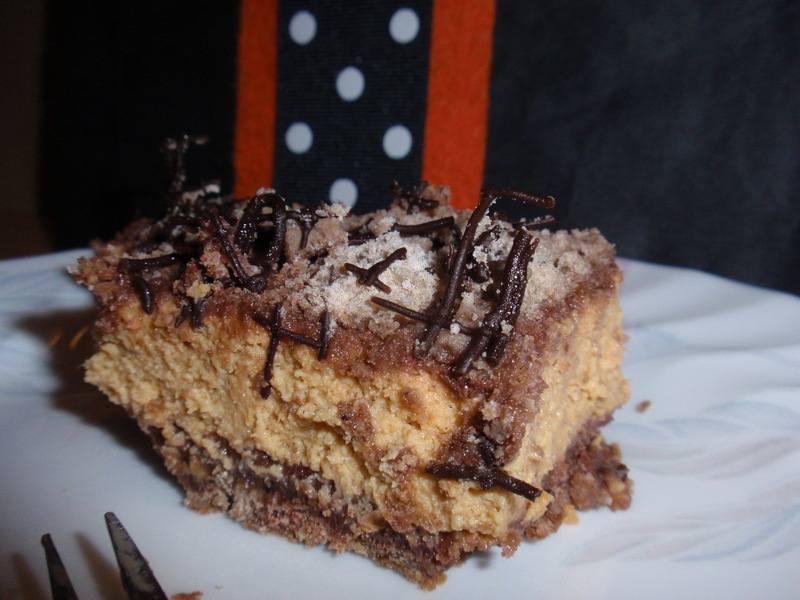 The original recipe is for Peanut Butter Cheesecake Bars. I changed the crust to be chocolate, subbed pumpkin for peanut butter, and added pumpkin pie spice. MMMMMM. It was great. I found it a little difficult to cut through the crust in the pan, so I would suggest lining the pan with parchment paper with a slight overlap, so you can lift the bars out of the pan easily. Beat cake mix and butter in large bowl with electric mixer at medium speed until just crumbly. Reserve 1 cup of the mixture. Press remaining dough into ungreased 13×9 inch baking pan to form crust. Bake 10 minutes, cool in pan on wire rack. Beat cream cheese and pumpkin at medium speed until fluffy. Add pumpkin pie spice to taste. Beat in eggs, one at a time, scraping down side of bowl occasionally. Gradually beat in sugar until light and fluffy. Spoon filling over cooled crust. Sprinkle over filling. Bake 45 minutes or until filling is just set and knife inserted into center comes out clean. Cool 30 minutes in pan on wire rack. Refrigerate at least 2 hours before serving. Drizzle with melted chocolate, if desired. Makes about 2 dozen bars. 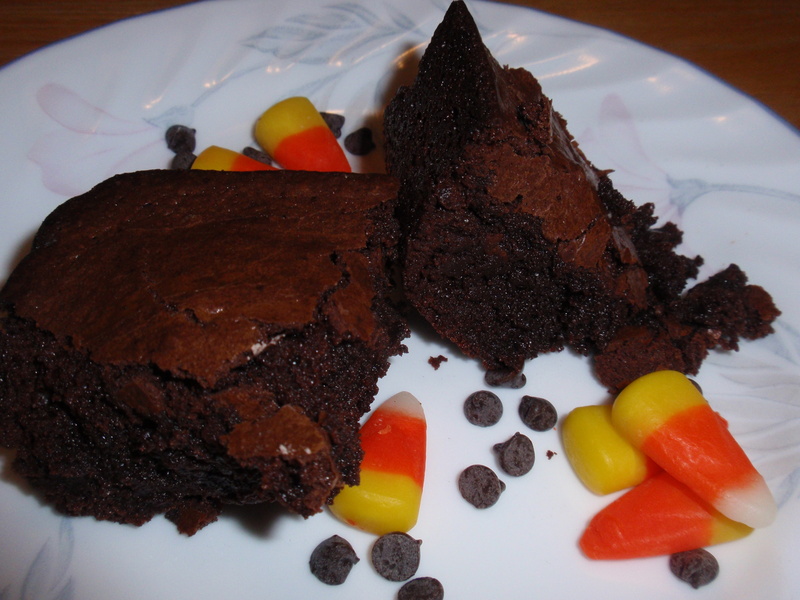 *You can also use yellow cake mix and throw a box of chocolate pudding in it. 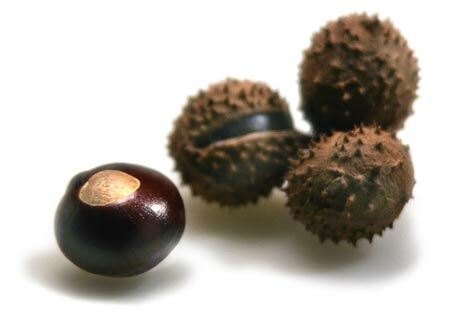 If you’re not from Ohio, you might be wondering what a buckeye is. Seriously. Two of my coworkers asked me what a buckeye is today. Silly Nebraskans. 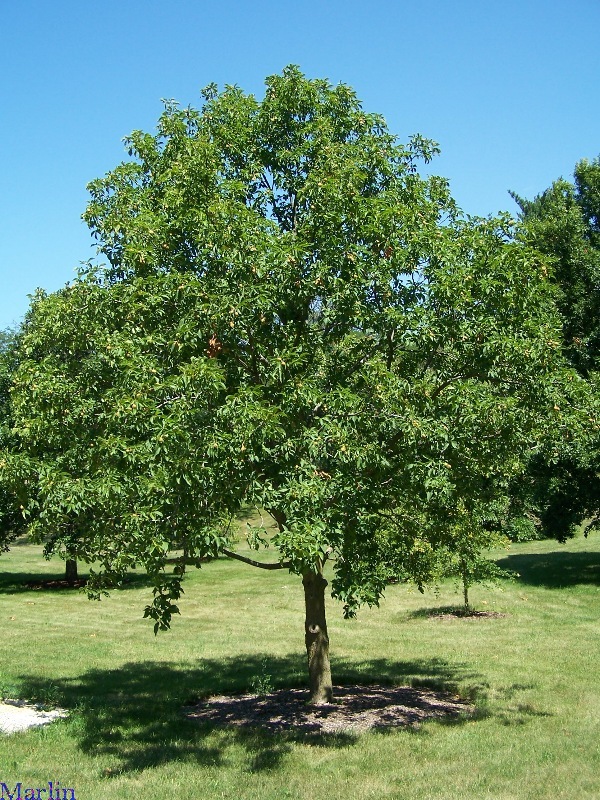 This is a buckeye tree. It is, in fact, the state tree of Ohio, my home state. Buckeye trees drop buckeyes (a kind of nut. They’re actually poisonous, so don’t try to eat them). They start out protected by a spiky shell, which eventually cracks open and the buckeye falls out. There was a buckeye tree down the street from my grandparents’s house. I remember when we were younger we would walk down the street and collect the buckeyes. There’s something weirdly pretty in an organic sort of way about the smoothness of the shell and the light-colored center. But what does all this have to do with candy? Somewhere along the way, some genius Ohioan decided to make an edible, candy version of the buckeye. Whoever they were, I love them. Anyone who’s lived in Ohio has experienced these. They’re a very popular dessert during football season – thank you, Ohio State Buckeyes football team! During the holidays you’ll see them pop up a lot in gift baskets and such, too. The traditional recipe that I grew up making uses a mass amount of powdered sugar, butter, and peanut butter for the filling. It’s fantastic, but super sweet and a total dentist’s nightmare. 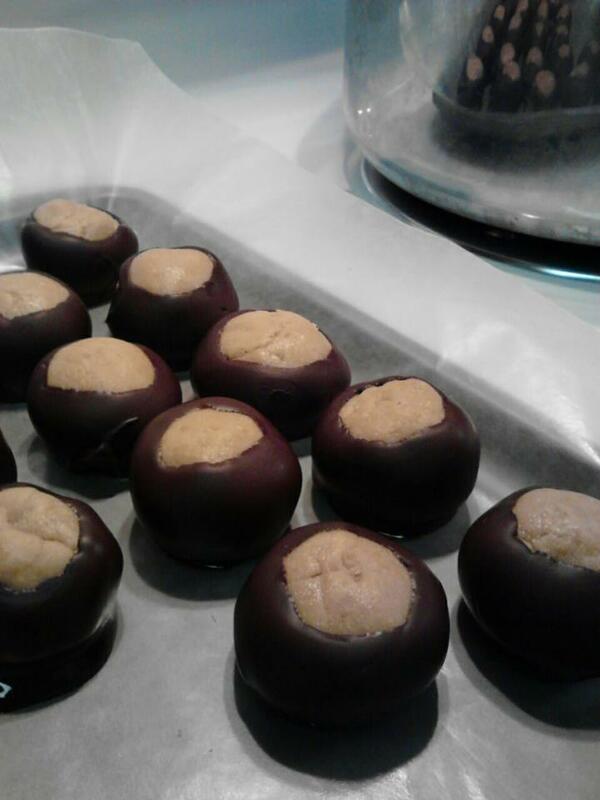 I decided that I needed to make candy buckeyes this week for the OSU vs. Nebraska game. I love an excuse for themed desserts! 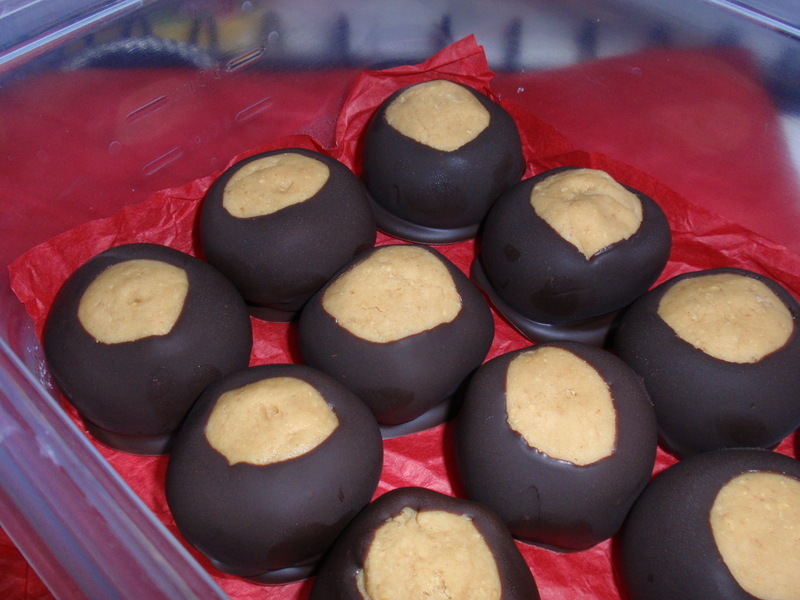 While I was googling, I came across a slightly modified version of candy buckeyes that I decided to try. 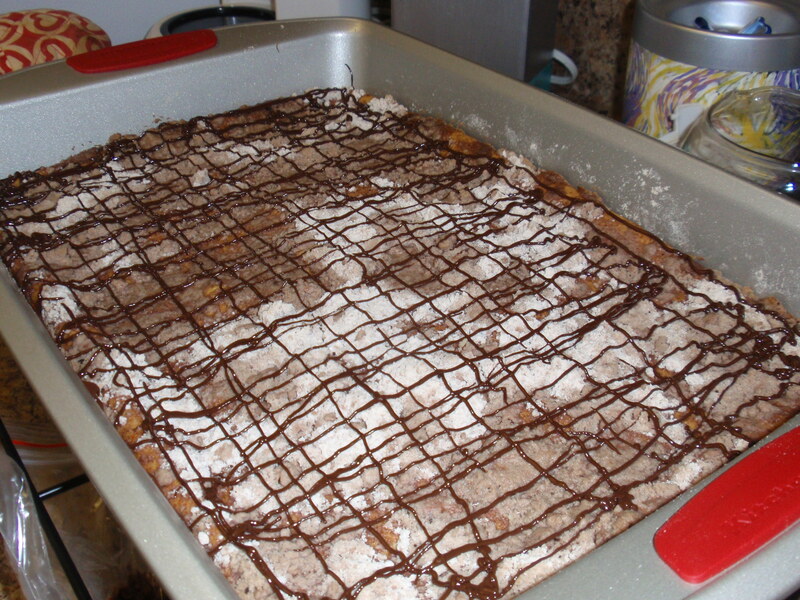 Less powdered sugar, but with the inclusion of graham cracker crumbs and cream cheese to hold the filling together. I decided to give it a shot. The recipe is from Smitten Kitchen, a really fantastic blog. I’ve actually been perusing a lot of recipes on there lately. I modified the instructions a bit for you guys. Make the filling: Beat the cream cheese and peanut butter together until combined. 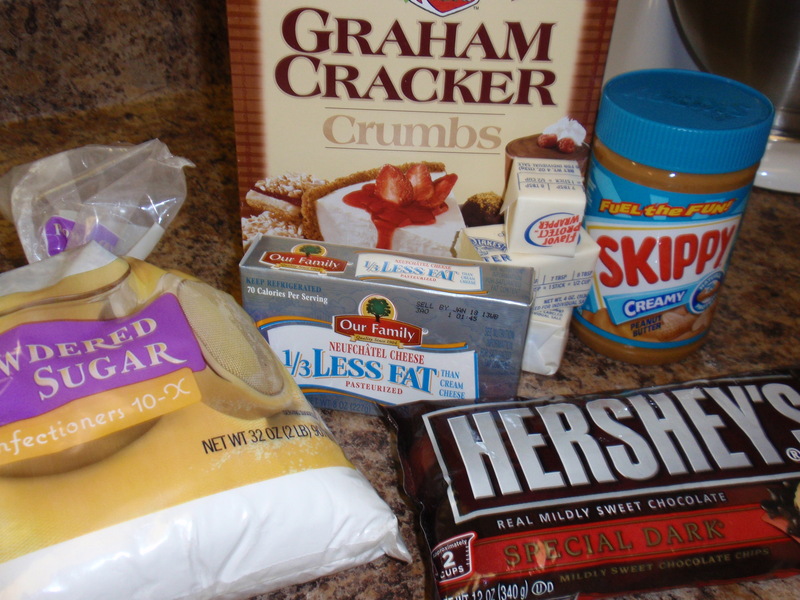 Add the graham cracker crumbs and beat. Add the powdered sugar gradually, and butter, and mix on the lowest speed until you’re no longer in danger of that awkward explosion of powder sugar. Increase speed to combine. Scrape down the whole bowl well, then mix again. I chilled my batter for maybe 20 minutes and then shaped into balls. How big you make them depends on what sort of peanut butter to chocolate ratio you’re going for. I made mine maybe tablespoon sized? 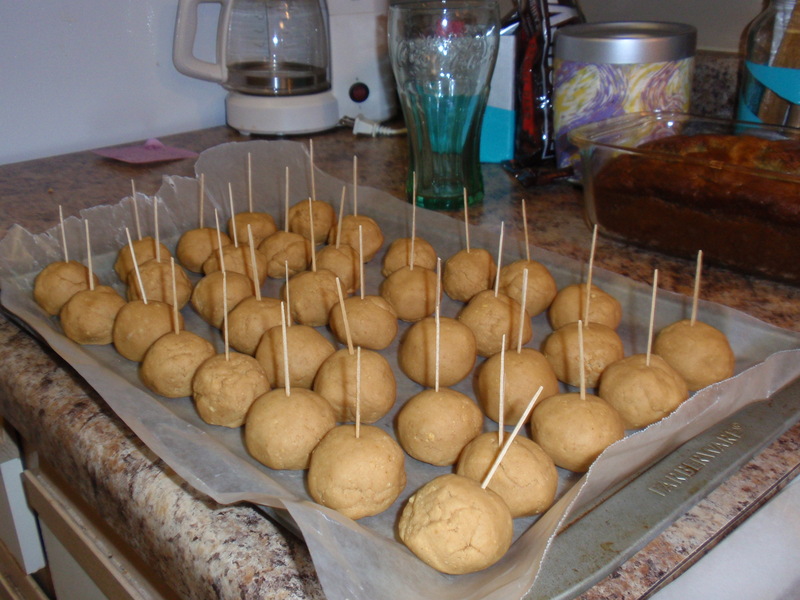 Place the peanut butter balls on a cookie sheet lined with wax paper. Stick a toothpick in the top of each (this will help with the dipping later). Stick in the freeze for half an hour. Do some laundry…maybe watch an episode of Parks & Rec. Whatever. 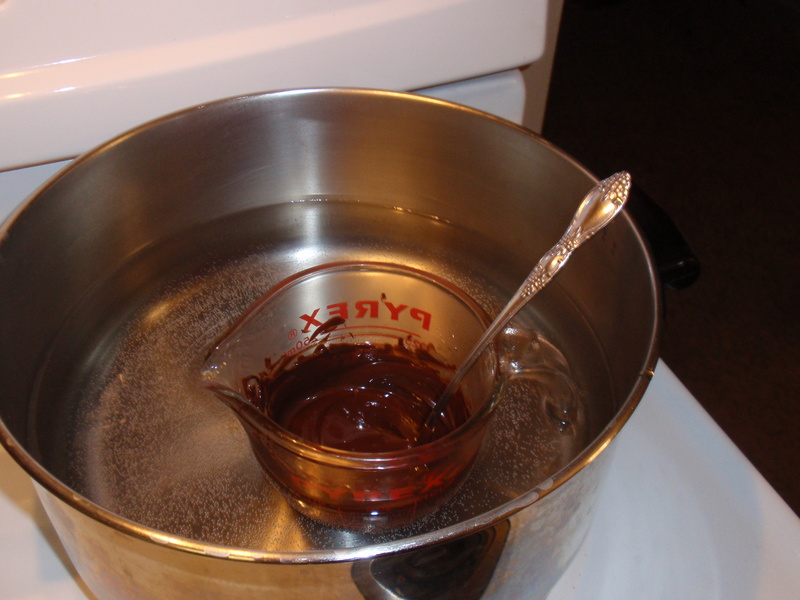 Make the coating: Melt the chocolate either over a double boiler (or a fake double boiler: glass dish partially submerged in warm (but not boiling!) water in a larger pot), stirring until it is completely smooth or in a microwave in 30 then 10 second increments, stirring before you start it again until it is completely smooth. Let it cool a bit before dipping. You don’t want to melt your peanut butter balls! Holding up by the toothpick, dip each ball into the chocolate and roll it about so that almost the entire candy is coated, leaving a small circle uncoated – the center of the buckeye! Place on the wax paper. When I did these, the chocolate warmed the peanut butter enough that I could just slip the toothpick out and then smooth over the hole, leaving no evidence of the toothpick! Tricky. Chill the buckeyes until they are set, about 30 minutes. I prefer to eat them at room temperature. If you’re going to keep them for a few days (how they would last that long, I don’t know! ), stick them in the fridge. Makes somewhere between 36 and 60(!!) depending on how big you make them. Oh candy buckeyes…how I love thee. Still, they were pretty dang delicious anyway. Mmm. I have a go-to brownie recipe that I judge all other brownies by. This is not it. But these were pretty dang good. I tore this recipe out of my Everyday Food magazine (yes, I have a subscription to that – don’t judge) because it was gluten-free. I have 3 coworkers who are gluten-free and have been wanting to try my hand at some gluten-free recipes because of that. There’s no flour at all in this recipe. Instead, it used cornstarch, which provides the same lift as flour, but has no gluten. Please note, when they say “fudgy,” they mean it. These are a dense, chocolate-y treat. I read the “12 oz of chocolate chips” line twice before I believed it. That’s an entire bag of chocolate chips! That you have to melt! Very different from my go-to brownie recipe. My coworkers devoured them, though. Success. Preheat oven to 350. Grease 8-inch square baking pan. Whisk together cornstarch, cocoa, cinnamon, and salt. In a large microwave-safe bowl, microwave chocolate and butter in 30-second increments, stirring each time, until melted and smooth, about 2 minutes. 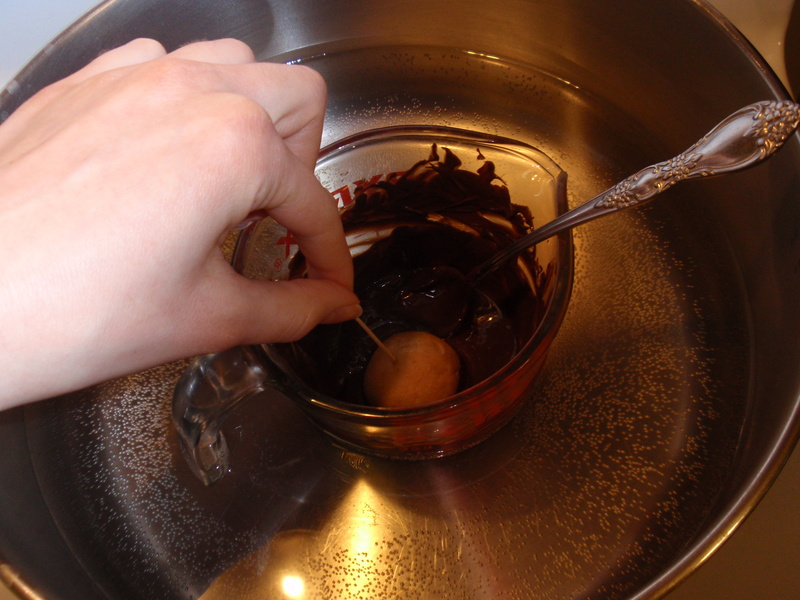 Alternately, you could use the double-boiler technique. Stir in sugar and vanilla. Stir in eggs, one at a time, until combined. Add cornstarch mixture and stir vigorously until mixture is smooth and begins to pull away from the side of bowl, about two minutes. Stir in whatever nuts you want. Or skip this step. I won’t judge. Pour batter into pan and smooth top. Bake until a toothpick inserted in center comes out with a few moist crumbs attached, about 35 minutes, rotating pan halfway through. *Walnuts, hazelnuts, whatever floats your boat. This can only turn out amazing, right? 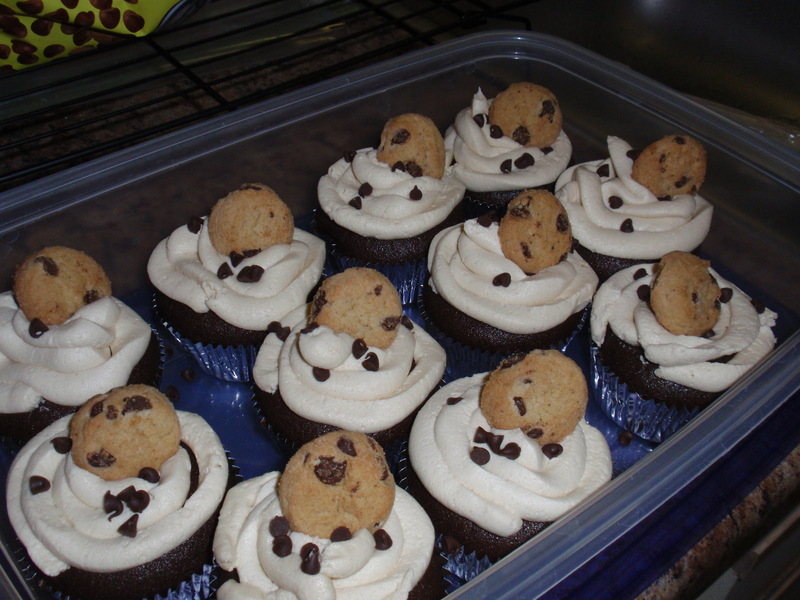 Chocolate cupcakes with cookie dough centers. Amazing. The frosting is even cookie dough flavored. The recipe is from Recipe Girl. Click on over and check it out. My suggestions: Make the cookie dough (it’s egg-less, ps) the night before and freeze overnight. It eliminates one step the next night (and these are labor-intensive!) and ensures your cookie dough center will not bake and turn into a cookie center. Which isn’t necessarily bad, but I was going for a cookie dough feeling. 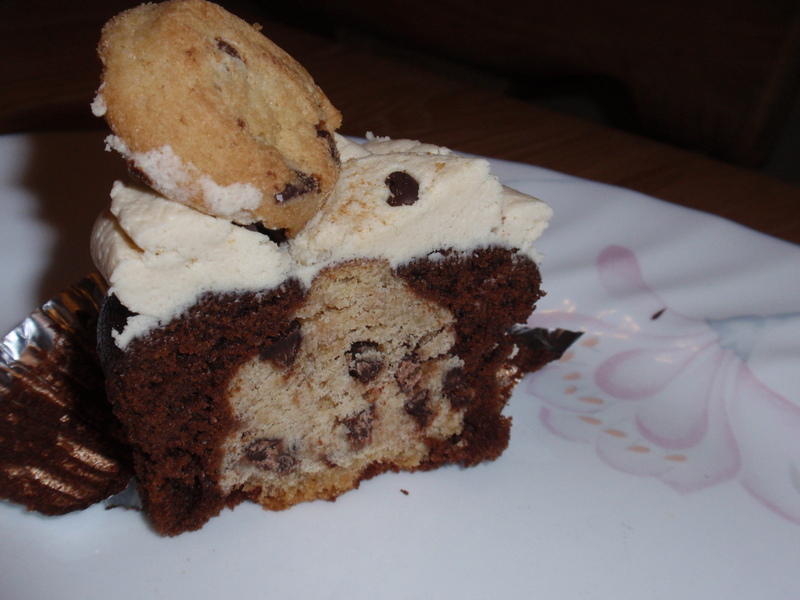 I think this idea would lend itself to several variations: Peanut butter cookie dough in the middle (which my friend Erin tried out), White cake with chocolate chip cookie dough centers, White cake with snickerdoodle centers, etc.